Fig. 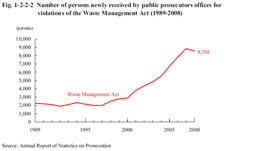 1-2-2-2 shows the number of persons newly received by public prosecutors offices for violations of the Waste Management Act over the last 20 years (See Appendix 1-4). The number was consistently increasing from 1998, but was down 3.3% from the previous year in 2008.